Bigamy, a double-talking parrot, and a sprinkling of familiar faces spice up this episode. Watch for Edgar Buchanan (Uncle Joe on Petticoat Junction) as Coroner Andy Templet and Joseph Kearns (the perpetually hassled Mr. Wilson on Dennis the Menace) as Edward Langley. Yes, there is a talking parrot in this story, and it does wind up �testifying.� The voice of the parrot is that of Mel Blanc, who also provided the voices for Bugs Bunny, Elmer Fudd, and a host of other Warner Brothers cartoon characters. CARS: 1956 Chevrolet 150 4dr sedan, light color (Taxi); 1958 Chrysler Windsor Town & Country 4Dr station wagon, medium color; 1958 Lincoln Continental Mark III Convertible, light color, top down, Lic No PHW 175; 1958 Cadillac convertible, black, white interior, top down (Mason). Cameos: 1955 Oldsmobile 88 Holiday Coupe 2-tone with a light-color 1951 Dodge Wayfarer 2Door Sedan. From The Cars by Greg Cockerill. The courtroom in Logan City is a treasure trove of Presidential portraits. There are at least three pictures of George Washington. Also present are U.S. Grant, Andrew Johnson, Abe Lincoln, Thomas Jefferson, James Madison, and John Adams. There is one more portrait directly behind the front desk, but at no time is the face shown. Submitted by PaulDrake 33, 12 July 2008. The court reporter/stenographer is Jesslyn Fax. 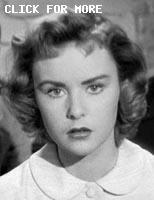 She and Raymond Burr both appeared in the classic Rear Window. She was the sculptress. She also appears in TCOT Nervous Neighbor. Submitted by billp. 15 November 2009. Location: The lake in Logan City is shown about 6 minutes and 20 minutes into the episode. In actuality it is Malibou Lake between Malibu and Agoura, CA. Malibou Lake is used quite often in the series. You can pretty much figure if Perry ever leaves the office for a lake it's Malibou Lake. It is featured in at least episodes #7, #26, #45, #71, #113, #195, #210 and #261. Posted by Eric Cooper 15 December 2009. More here. Character Names: Criminologist Mr. Langley�s first name is Edward. Submitted by gracep, 8/9/2010. 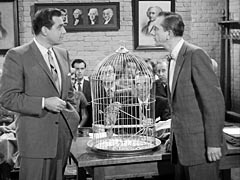 ++ Another connection is Raymond Burr himself who appeared in character as Perry Mason in the episode "Jack on Trial for Murder" (November 5, 1961). Murdering a rooster, that is. Submitted by Wiseguy70005, 5/29/14. +++ That Jack Benny episode featuring Perry Mason is a classic piece in which Burr shows fine comic timing. It's also a PM showcase, featuring familiar faces from the series: Frank Wilcox as the judge, Grandon Rhodes as a process server, and even George E. Stone as court clerk. This episode seems to be available only on VHS (I just scooped one up), but it's easy to find on YouTube. A must-see for fans of the show. Submitted by francis, 07/05/14. ++++ It is available in syndication/cable reruns although it may be hard nowadays to find a station that shows it, perhaps one of those "digital subchannel" networks like MeTV. The episode of Jack Benny I'd like to see is the "Twilight Zone Sketch" episode featuring Rod Serling but that episode seems to be one of the live episodes that aren't in the rerun package. Submitted by Wiseguy70005, 7/15/14. Syndication cuts: Della reports that a club wants a lock of Perry's hair to auction off for a benefit [this sounds like a line that deserves to be cut]; Della feeding a squirrel, Mason noticing a wire tap, investigating its source, an empty cabin; Della arrives, reporting Paul is investigating phone calls from the cabin; scene with Bascomb, the Sheriff, DA Sprague and Ellen. Additional Hallmark cuts: Part of Mr. Langley's theories at the cabin including walking to the fireplace, saying Sabin was killed a little after 11 on Tuesday after lunch and before cleaning the fish and the parrot interrupts him; Bascomb testifying he didn't see Sabin all week, driving by, seeing his car and looking in the window, and the coroner's remarks to the jury; as Langley is sworn in, the coroner's telling Mason that he wants Langley to give his theories even though Mason will object but Perry agrees and the coroner tells Langley to go ahead; Mason asking Langley if Sabin's being so hungry he ate or in a rush to put logs in the fireplace before cleaning the fish or putting logs the night before was logical and Langley's response that there are often trivialities that aren't consistent with the broad picture. Submitted by Wiseguy70005, 8/18/12. After watching the DVD version and then seeing a syndicated version with all the cuts you really see how it just makes the stories hurried and less enjoyable. A lot of the quick personal interplay gets cuts first. Submitted by Perry Baby 2/3/15. This is the third episode in a row where the murder victim is the husband in a bad marriage. I wonder about the next episode...Submitted by Duffy, 5-14-2014. The parrot cage must have been moved when Sabin's body was. When Bascomb looks in the window the cage is at the corner of the chair. When the sheriff and Mason enter, the cage is now directly on the side of the chair. Submitted by Wiseguy70005, 5/29/14. Both the novel and the episode state the murder took place in September. The cookbook found in the cabin has checkout dates throughout 1958 stopping in September so apparently the episode takes place in September 1958. However, the first date listed is in December 1958 which hasn't happened yet. Should have been December 1957. Also Mason tells Ellen the book was checked out on the 11th but the book clearly says the 9th. Submitted by Wiseguy70005, 5/29/14. + I researched the book and found that, as far as I could find, neither book nor author exists. OLEF641; 10/6/2017. ++ The book itself may have nothing more imaginative than "Cook Book" on it, but the author's name has ESG's style written all over it: Valentine Prosper...Gardner (or whomever) really out-Pitkined him(them)self on that one !! Notcom, 100617. At 43:39 during Richard Waid's testimony, the audio goes silent about three times after he says "found my accounts short" as if an unwanted noise was edited out. Submitted by Wiseguy70005, 5/29/14. Consistency As noted above, this is the third appearance of Logan City - though the second was only a cameo - and although the Fourth Estate (perhaps) doesn't jive, in other ways there were matches: the exterior of the Courthouse (which actually looks like it might be a real building somewhere) seems the same, and the Courtroom is very similar (if unrealistic: exposed brick is unlikely even in a small, simple facility). Less plausible is the presence of a lake - since the other episodes either implicitly or explictly had LC in the desert...though the lake being set in the (presumably cooler) foothills above the city is possible. Noted by Notcom, 091616. Not to be insulting but I've always thought actress Jesslyn Fax looked like Alfred Hitchcock in drag. Submitted by Wiseguy70005, 5/30/14. When I first saw this episode I felt that Mrs Sabin was guilty of something. The way she spoke in Perry's office when she and her daughter Helen went there just after her husband Charles was murdered was so over the top it seemed like she was trying to deceive Perry for some reason. By the way, this is one of my favorite episodes. I like the way Perry takes apart Mr. Langley's analysis of the murder. Submitted by Kilo 4/9/2018. So is this another example of the murderer in an earlier scene pretending to be innocent when no one is watching? (Except us.) Submitted by Wiseguy70005, 8/18/12.